Clean@auto reports from Monaco that the French Propane and Butane Federation (CFBP) and the World LP Gas Association (WLPGA) are showcasing a Prius hybrid modified to burn Liquefied Petroleum Gas (LPG) in its engine. 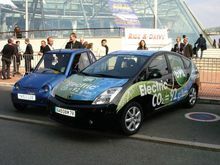 RM Gaz worked with the CFBP and the French Petroleum Institute (IFP) in building the Prius LPG-electric hybrid. The car delivers comparable range to the conventional hybrid, but with fewer emissions. After all factors are considered, LPG use consumes about 5% more fuel for equivalent performance to gasoline (but it costs less). In general, LPG yields about 50% less carbon monoxide, 40% less hydrocarbons, 35% less nitrogen oxides (NOx) and 50% less ozone forming potential compared to gasoline. The Toyota Prius LPG prototype emits only 92 g/km of CO2—11.5% less than the gasoline version. LPG is the generic name for mixtures of propane and butane gases. The chemical composition of LP Gas can vary. Autogas—automotive LPG—generally ranges from a 30% to 99% propane mix. According to Shell, for example, in the UK autogas is predominantly propane, but the rest of Europe more commonly uses a mixture of butane and propane. LPG is derived from crude oil refining or from natural gas or oil production. Currently, more than 60% of global LP Gas supply comes from natural gas processing plants, but the share varies substantially among regions and countries. In the US, the figure is closer to 70%. With both processes, LP Gas must be separated out from the oil product or natural gas streams. it brings a smile to my face to finally hear toyota come out with an lpg vehicule,though i don´t understand why hybride. i live in dominican republic,where a great variaty of vehicles and models are being used with lpg do to high gas prices. i would like very much for the automobile industry to explore deeper into lpg and the great future i believe exists for all matters. i understand ford,bmw,gmc among others already have lpg motors in their line assembly but i don´t see much promotion or sales. hope this beginning won´t be slow. its good to use this gas but can you give the chemical composition of auto gases so that the customer will be better understand the advantages of these gases.